A Fife man who tied a friend's dog to a tree before dousing it in petrol and burning it to death after it had bitten him has been jailed. Alastair Graham, 23, killed the Staffordshire bull terrier cross at Kirkcaldy's Dunnikier Woods in April. He has been jailed for nine months for the dog's death and 36 months for his part in a later attempted robbery. The sheriff described the killing of the dog as a "grotesque act of savagery". He further admitted an attempted knife robbery committed alongside Steven Gourdie on 2 May in Leven's High Street. 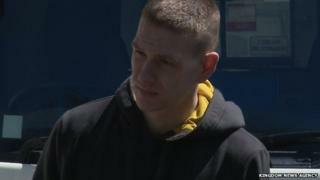 Gourdie will be sentenced for the robbery on 1 August. Kirkcaldy Sheriff Court heard that Graham had been looking after the dog. After it bit him, he first attacked it with a knife. CCTV footage from a petrol station showed him filling a container with petrol. A similar container was found melted beside the dog. Solicitor Larry Flynn, defending, said it was a serious offence which Graham had little memory of because he was abusing alcohol at the time. Sheriff James Williamson jailed Graham for 45 months in total - nine months for the dog attack and three years for the robbery. Graham was also banned from keeping animals for life. The sheriff said: "He went about this in a calculated manner - it wasn't a spur of the moment thing. "This was a grotesque act of savagery. "You will be disqualified from keeping animals for life. "The sentences will run consecutively - the total will be 45 months." Ian Laing, wildlife crime officer for Police Scotland's Fife Division, said at the time of the crime: "This defenceless animal suffered immensely prior to its death and the incident evoked considerable outrage from the local community. "A robust investigation was launched to identify whoever was responsible, resulting in Alastair Graham being arrested and charged. "His guilty plea is testament to the work carried out by Police Scotland to bring this offence to trial and the support from the public who provided vital information during our enquiries." Bruno's owners, Christopher McMahon and Chermaine Letham, said Graham was "evil" and described the maximum sentence of their dog's death as "disgusting". Ms Letham said: "Receiving a year maximum is disgusting considering in America a man did the same thing and got five years. "If he can do that to a helpless dog then what can he do to a child or elderly person? "His maximum sentence is a joke. He tortured and murdered a family pet simply because he bit his finger."